Graduate certificate programs consist of courses that help you develop career competency in a specialty area. 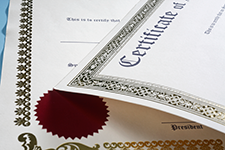 A certificate typically consists of four to eight courses which can be completed in a few semesters. Unsure about pursuing a Master’s degree? You may choose to pursue a graduate certificate instead because they are more affordable and time to completion is faster. Often credits earned in a graduate certificate program can be transferred to a Master’s degree later if you so choose. Always check with the institution prior to starting a certificate program to verify that the courses will apply toward a graduate degree.